Luang Phu is a true Kammathana Forest tradition Master of Vipassana, who was ordained by the Great Luang Phu Man Puritadto (LP Mun) himself, and was instructed and trained in Magical Wicha by the Legendary Luang Phu taep Loke Udorn. Luang Phu is an Anomaly because he is Miraculously able to speak a variety of different Languages. He can speak with Ghosts and Nature Spirits if the various different Realms and Dimensions. As Luang Por reached the Old Age of 95 , he began to change from Old and Weary body, to become ever stronger and agile, who to this day even at the age of 115 (2012), moves and talks like a 50 year old, and seems to be without any wear and tear since over 40 years. in 2555 Luang Phu Simplii released a range of amulets to raise funds for the Building of a Giant Buddha Image statue, called the ‘Maha Sethee 115 Pi’ edition (115 Years Millionaire Edition). The range included Monk Coins in the Image of Luang Phu, some Dragonfly Yantra Foils with a picture of Luang Phu attached, some ‘Loi Ongk’ statuettes of Luang Phu Taep Loke Udorn, and some Takrut Maeng Por (Dragonfly) Each amulet of the edition has ‘Rae Perm Palang Gaay’ (Sacred Mineral to increase Health and Strength) embedded. As Luang Phu was performing the Empowerment Ceremony (Putta Pisek) for this edition at the Temple, a Swarm of dragonflies began to buzz around the Ceremonial Area filling the air with the sound of their flight and the light sparkling from their gossamer wings like silver and gold. A Miraculous event indeed considering the fact that Luang Phu was empowering amulets with the Dragonfly Wicha Pokasap Magic. Some versions of the Amulets have a pice of Luang Phus Civara Robe, which was involved in a Miraclulous event where an M16 Weapon was unable to shoot as the Civara was present. His Civara robe is known to possess Maha Ud Gunstopper Power. 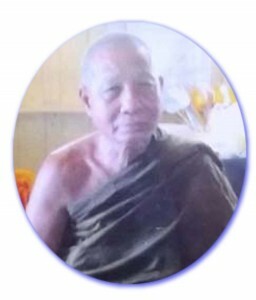 Luang Phu has developed and applied the Power to repair and rejuvenate his body to be able to Miraculously survive to the age of 115 Years old, and increase his health constantly over the last 40 years. Luang Phu is perhaps the only surviving Monk who was directly ordained by the Great Arahant Luang Phu Man Puritadto, making his amulets a definite Must for the devotees of the Luang Phu Man lineage of Arahant Forest Monks. To make Bucha to Luang Phu and his Amulets is to recieve Metta mahaniyom, Kaa Khaay, Choke Lap Pokasap clessings, as well as Klaew Klaad Kong Grapan protection and prevent Illness. Luang Phus name resembles both Pra Chimplii and Pra Sivali, (2 names for the same Arahant of prosperous Fortunes). In fact, Luang Phus Coin Amulets actually possess the Yant Pra Sivali on the back, preventing lack of funds, and making sure of plentiful supplies and cashflow. Luang Phu tells that he was once attacked by Bandits who planned to steal the Buddha Image of the temple, and tried to Kill Luang Por first to prevent capture. The used four M16 rifles to shoot at Luang Por from behind. Luang Phu just heard a ‘sak-sak-sak’ sound as the gun hammer repeatedly clicked but no bullets would fire. The Bandits were instantly frightened of Luang Phu’s miracle powers and dropped all four weapons, and ran off. Luang Phu did not have any amulets or magic charms on him, but simply his Civara robe that is all. So Luang Phu used this Civara robe to attach a small piece to each of the amulets in his Maha Sethee 115 Pi edition, to protect his Devotees from deadly dangers.